Who doesn’t love Chicken Cordon Bleu? 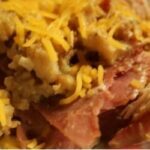 I have tried 2 different crockpot recipes for Chicken Cordon Bleu. They were both good, but I thought this one turned out slightly better. See the Printable Recipe Below. Place chicken in the bottom of the slow cooker. I cut mine up, so that it would serve more people, but you wouldn’t have to. Mix Cream of Chicken Soup with milk and pour over the chicken. Cover with slices of ham. I used ham lunchmeat, but if I do it again, I’ll use a slightly thicker cut of ham. Mix up the stuffing mix with the water. Put over the top of the ham mix. The butter that was supposed to be mixed in with the stuffing mix can be cut into pats and placed on top of the stuffing so that it slowly sinks in throughout the day. Let bake for 4-5 hours on high or 8 hours on low. I ended up topping mine with a little extra shredded cheese that I had on hand, because the Swiss melted on into the dish! Place 5-6 Chicken Breasts in a Gallon Size freezer bag. Place sliced swiss cheese and ham pieces in a smaller quart size bag. Place the small bag inside the larger bag. Label bag with Chicken Cordon Bleu Casserole.